Not only is the Whimsical blog to share what we've been up to! I'd also like to share some fun stuff that I find along the way! Although our main focus has always been on custom designer cakes, cupcakes have always been a big part of our business! 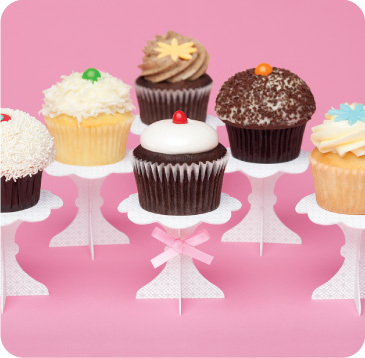 I like to keep on top of what's new in the cupcake world and just had to share these cute stands with y'all. And these lovely hand crafted stands I found on Etsy...I wish I took up pottery! I feel a random draw for mini cupcake stands coming on...to be entered to win a package of stands by Hello Hanna, just leave a comment on our blog about how you'd use the stands and we'll randomly select a winner after September long weekend! WINNER OF OUR HELLOHANNA STANDS IS....Sandi S.
Send us an email and we can get you your stands! Labels: Etsy, Hello Hanna, Individual cupcakes, mini stands, Rosanna Inc. These are very sweet. I love doing cupcakes for just about every occassion and with an anniversary and some great holidays around the corner, I'd absolutely love these. And all of their uses to make life really grand! Birthdays, parties and gatherings galore! Such uses I envision and still even more! Is to show off a Whimsical cupcake...for me!! I just got to have one or two or three. They are sooo cute! 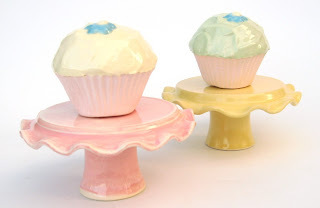 These cute cupcake stands would be perfect for displaying your divine sweets. I would love to use them for my upcoming birthday. I would use these cute little stands as place card holders. I would put a cupcake on it with mounds of icing. On top of the cupcake I would put a decorative name card stuck in the icing. I just love these!!! So cute! These cupcake holders are absolutely adorable. I would use them to display the cupcakes I frequently make. Cupcakes are good for every occasion :) Mondays counts as occasions.... right?? I've recently begun making icebox cupcakes and would love to display them on these nifty little holders. And since the draw is taking place after the long weekend, I'd say it'd be a wonderful birthday present for my 30th! The serving medium serves as the central stage for an outstanding sweet performance. Having dove deep into creativity to create stages for Whimsical masterpieces in the past it would be wonderful to have someone's creativity offered to me! I love decorating cupcakes. 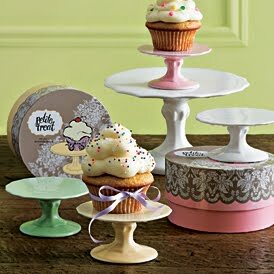 I would love to use these for displaying cupcakes, especially come the holidays. It just would add a little something to make the cupcakes even more special. I'd use them as a display for afternoon tea, along with with a tiered plate with other dainties. I love tea and cupcakes! I would like to use them for my wedding. In lieu of favours I'm going to make a donation to one of our favourite charities, and I am going to have cupcakes for each guest. These stands would add so much more to the display! I love all of your cupcake stands!! I would use them for birthday cupcakes for my little princess!! What a great element for a baby shower! and.... it just happens that I have a first baby shower for my neice and her husband on September 12th....what a great suggestion Clock Wedding Productions! 'Baby' (mini) Whimsical cupcakes would be perfect served on these Hello Hanna stands to a room full of baby oogling ladies! I love cupcakes - built in portion control yay! I think I would use the white paper on a black table cloth with a black ribbon or cutout bat tied around the stem with some appropriately decorated (chocolate of course) orange, purple or black cupcakes as a part of a halloween soirée. Or, as it is my birthday on wednesday, as a way to make a birthday treat seem a little extra special. These are the cutest little stand ever! I love them and need them! Never seen these little stands before, would love to get some for future birthday parties. 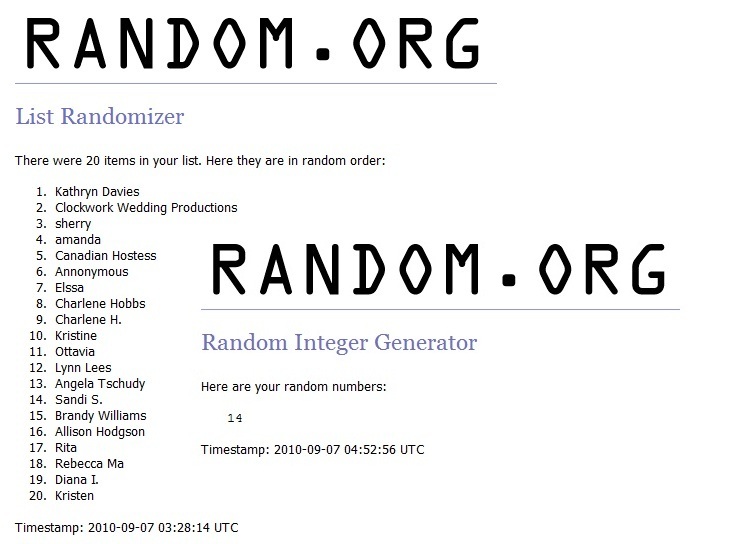 Thanks for the entries! 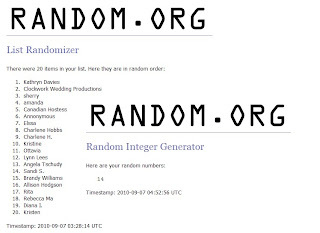 We picked our winner last night! Sandi S. send us an email or call and we can get you your stands! YAY!